Tennessee, the Volunteer State, has begun to push back against the tyranny that is the indefinite detention provisions contained in the National Defense Authorization Act of Fiscal Year 2012, better known simply as the NDAA. The state bills currently being considered could be one of the most significant steps taken against the atrocious assault on our most essential liberties embodied by the indefinite detention provisions of the NDAA. The Tenth Amendment Center (TAC), a group promoting states’ rights (something which I think is an honorable cause in these dire times in which we have an increasingly centralized, authoritarian federal government) reports that two bills are to be considered in the Tennessee legislature. These include HB1629 and SB2669, both of which are set to be considered in the 2012 session. The legislation could essentially nullify the troubling indefinite detention provisions in the NDAA by requiring federal agents to obtain written permission from the county sheriff before making any arrests in Tennessee for any reason. So long as county sheriffs are actually doing their job and keeping people safe from an out-of-control federal government, this could be a major step forward. On the second episode of End the Lie Radio, Bob Tuskin and I discussed how sheriffs can act as a buffer between federal tyranny and the American people, something which these bills are going to reinforce. The actual text is quite striking, and to me it is very exciting that such a thing is even being placed before a state legislature. This bill declares that any federal law purporting to require local or state law enforcement agencies to act at the direction of the federal government or the United States military is beyond the authority granted to the federal government pursuant to the United States Constitution, is not recognized by this state, is specifically rejected by this state and is declared to be invalid in this state. This bill further declares that any federal law purporting to give federal agents or employees, including any members of the United States military, the authority of any state or local law enforcement agency of this state, without the express permission of this state, is beyond the authority granted to the federal government pursuant to the United States Constitution, is not recognized by this state, is specifically rejected by this state, and is declared to be invalid in this state. I try to cover the troubling blending of local, state and federal law enforcement as much as possible, although I can never touch on it enough. This bill is fighting back against exactly what I — and so many others — have been speaking out against unrelentingly. It is trying to properly separate the local and federal law enforcement agencies instead of allowing the continued trend in which local power is eradicated in favor of more centralized bureaucracies. This is done in a myriad of ways, but some of the most prominent are the so-called “fusion centers” which blend local, state, and federal law enforcement along with military and civilian personnel and the Pentagon’s 1033 program in which they outfit local law enforcement with free military hardware. There is also the matter of federal grants from entities like the Department of Homeland Security (DHS) which essentially put local jurisdictions into federal receivership, making them beholden to the whims of the centralized bureaucracy instead of the people they are supposed to be serving. Mike Maharrey, the communications director for the Tenth Amendment Center, makes a great point in saying that the American people should not blindly trust in the good intentions and moral compass of the president or federal judges who are supposed to be protecting our rights but all too often actively strip them from us. “It falls on the states to step in and protect their citizens,” he said. Indeed I can’t think of anything which is a more troubling attack on everything that America is supposed to be, and I’m not willing to put my faith in the federal government, hoping that they interpret the NDAA’s indefinite detention provisions in a way wholly different from that in which they are written. This would simply be imbecilic of me, given that we do not even know how the federal government actually interprets the PATRIOT Act, nor what legal justification they think there is for assassinating American citizens without charge or trial. 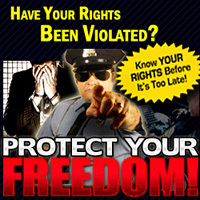 The Tennessee legislation also has some teeth to it, beyond just requiring written permission from the county sheriff; it actually “makes it a Class E felony for any official, agent or employee of the United States government to enforce or attempt to enforce any federal law, order, rule or regulation that is beyond the authority granted to the federal government pursuant to the United States Constitution,” and it even includes provisions which would allow for kidnapping charges to be filed against any federal agent who detains an American citizen in Tennessee under the NDAA. Unfortunately, the last bit of that passage may open it up to challenge or circumvention, given that a corrupt judicial system could easily determine that everything in the NDAA, including the indefinite detention provisions, is indeed granted to the federal government pursuant to the United States Constitution. The sponsors of the House version of the bill are Representative Bill Dunn, a Republican from Knoxville, and Representative Cameron Sexton, a Republican from Crossville. The Senate sponsor is Senator Stacey Campfield who is also a Republican from Knoxville. Thankfully, it is not just Tennessee fighting back against this attack on everything that American was built upon, indeed Washington and Virginia are also considering legislation which would essentially nullify the detention provisions in the NDAA. Some local governments have also stepped up to the plate, including the El Paso and Fremont Counties in Colorado. I have previously covered a similar effort in Rhode Island, although that has been criticized not on its merits, but due to the troubled history of the individual behind the legislation. You can witness just that going on in the comments section of my article. The most common argument is that the NDAA and the indefinite detention provisions therein do not actually apply to American citizens. If what supporters say is true and the NDAA does not authorize indefinite detention of Americans, what is the harm in this legislation? Why would anybody oppose it? It does nothing but serve notice that state and local officials will not sit back and allow the federal government to exercise unconstitutional powers – powers supporters claim don’t exist anyway. It simply affirms a fence that supposedly already exists. The only rational I can find for opposing this bill is if they really do want the option of detaining Americans without due process to remain open. “You can only oppose this legislation if you accept the idea that the federal government has the authority to do whatever it wants with absolutely no check on its actions – Constitution be damned. If you ask me, that’s a lot scarier than whatever terrorist threat they claim to be protecting me from,” he added. This is precisely the point I have tried to make to supporters of the NDAA time and time again. If this isn’t going to ever be used against us, why can’t they explicitly outline that in the text? The fact is, as it currently stands, there is absolutely nothing limiting or prohibiting the indefinite detention of American citizens without charge or trial. Indeed, the only thing the indefinite detention provisions say on the matter is that American citizens are not required to be held indefinitely if suspected to be terrorists. There is absolutely no language saying that they are not allowed to do such a thing and no supporter has ever been able to counter that, at least none that I have conversed with. Michael Boldin, the Tenth Amendment Center’s executive, is confident that other states will follow the lead of Tennessee, Virginia and Washington soon enough. “We have pretty strong indications that Rhode Island, Utah, Maine, New Jersey, Oklahoma and other states will be introducing similar legislation soon. This is just a start – and activists all over the country need to contact state legislators right now to voice their support,” he said. I highly encourage anyone in these states to get involved and support this legislation however you can. Be sure to raise awareness and contact your representatives to be sure they support this once it comes up for a vote. For those who are not in these states, I urge you to join me in my efforts to get legislation like this introduced. The Tenth Amendment Center has made model legislation available along with a way to track local and state legislation across the United States. I recommend that you utilize these resources however you can as this could be the difference between patriotic Americans being thrown in a prison cell never to be heard from again, or Constitutional government being restored in the United States. I genuinely believe that there is nothing more important than protecting our right to due process and protection from a tyrannical federal government, and thankfully I’m not alone. If you are participating in or planning a campaign involving legislation like this, please email me immediately at [email protected] so I can publicize your efforts and hopefully help get you some supporters and raise awareness of your admirable efforts. Be the first to comment on "Tennessee begins to push back against NDAA tyranny"